Feeling peachy keen today my friends. And I can thank the Balm's Frat Boy blush and Benefit's Coralista gloss for brightening my day. What started out to be a sunny day turned grey and it all happened during an episode from season 10 of Project Runway. Speaking of which, is Andrea gone for good and why is everyone else cracking under the pressure? We're only four episodes in - Tim Gunn & Co. can't be that tough, yet! Where was I? Oh yes, coral. Warm hued pinks which inject thoughts of soft sand, azure blue water and a Pina Colada - but hold the pineapple, please! Quite frankly I'm over this lamb of a winter, because I can't wait to be able to wear the sandals I purchased on sale from Witchery a few weeks ago. Until then, a little bronzer and this coral look will have to tide me over. Let's get to the goods. the Balm is a label I'm not too familiar with, although I've read a few reviews here and there. As of yesterday we were strangers at best, but we've since become well acquainted. On my weekly stroll through David Jones, I noticed a new addition in the cosmetics' area and it just so happened to be the Balm. David Jones, thank you for bringing this line to Australia. 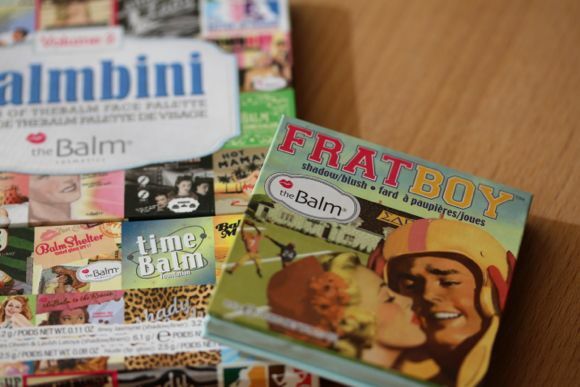 If you feel like spending at least $27.95 on any of the Balm products available, you end up getting a decent gift with purchase. Not willing to commit to a new brand, then I think this gift is the best way to be formally introduced. Frat Boy is super pigmented, so go in with a light hand when grabbing for this product. I recommend tapping your brush in order to nix the excess; I swirled my skunk brush and wound up dusting up more than I needed. Target the apples of your cheeks by smiling and alternate between your left and right cheek. For me, this helped to diffuse the rest of the excess which failed to shake out. A little really went a long way. As for my eyes, I applied Frat Boy atop the caramel and coffee shades from CK One's Heat eye quad. Then I added a little sparkle by brushing and blending out Urban Decay's Half Baked down the centre of my lid. The packaging is cute while managing to give a naughty throw back to the 1950's. There are no external boxes to worry about and most of the items clasp shut with an industrial strength magnet. I couldn't help but think this is what the offspring of Benefit and Soap & Glory would look like, if they had a baby. 9 out of 10 bags – packs a colourful punch, but doesn't say, "whoa, I'm wearing blush!" I'll give my gift with purchase a go first and possibly go back for more. Now for the lips, we can't forget them. 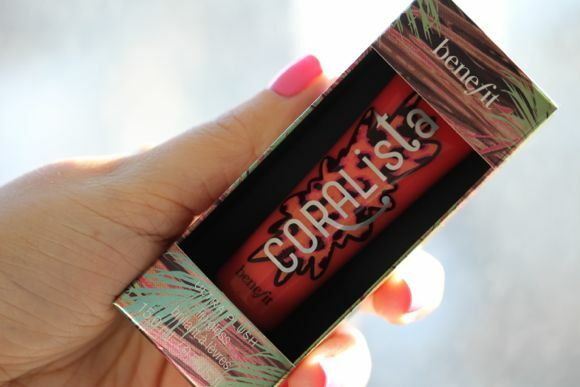 Last week Benefit rushed their new Ultra Plush Gloss over to us (we only had to wait a month or two - not too shabby). Gloss is usually not my thing, but I really wanted to give these a whirl. Upon setting my eyes on all six shades, I narrowed the final contenders down to Coralista and Sugarbomb. Under the harsh fluorescent lights of Myer, Coralista reigned supreme. 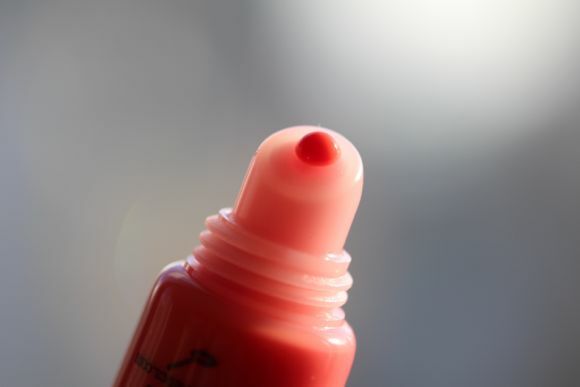 The formula is non-sticky, moisturising, slick and sticks around for three hours or so on me. In lieu of oiling the Tin Man's lips, I would suggest applying a touch of Coralista - he won't mind, because it smells a bit fruity, something like peaches. Applying Coralista is easy; you can either apply it straight from the tube or go in with a lip brush for a more defined look. Also, if you have highly pigmented lips like me and you want Coralista to show her true colours; it might be worth neutralising your natural hue with a bit of foundation or powder and then apply Coralista. My foray into the world of coral and peach has been so wonderful I think I might come back for a few more helpings. What better way to delude myself - wake me up when September ends. 7 out of 10 bags – Wish Coralista was a bit more pigmented and retailed for a lot less. I'll stock up on the remainder of the colours during my visit back to the States. Yep, that's right I'll be visiting my parents just before this holiday season.